If you happen to be wandering about the bottom of Market Street on a Thursday night, you will notice that weekends seem to start early. Tabbuli Grill can help you kick back after a day at work with a celebration of fashion for a great cause they call White Haute Nights. Tabbuli Grill, located near the Charleston Cruise Terminal, has turned Thursday nights into a world of fashion, entertainment, delicious food, and flowing drinks. The return of their White Haute Nights fashion show sponsored by Baker Motor Company Charleston Fashion Week has started 2015 off with a bang. 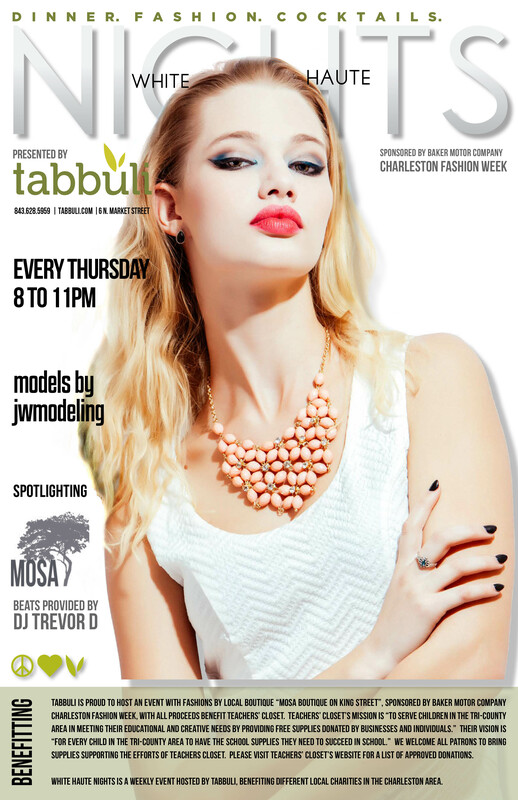 White Haute Nights is a weekly event featuring different designers hosted by Tabbuli Grill. The event benefits local charities in the Charleston area. This week, all proceeds benefit the local charity Teachers’ Closet. The vision of this charity is “for every child in the Tri-County area to have the school supplies needed to succeed in school.” It is welcomed for guests of the fashion show to bring supplies supporting the efforts of Teacher’s Closet. This Thursday January 29, White Haute Nights will feature styles by Mosa Boutique and the host is none other than Jaisee Alexander. DJ Trevor D will be making the party start around 8pm. The models from JWModeling will be styled by Ryan Matthieu Smith, and will be hitting the runway by 9. Hair and makeup will be by Seven Foxes. Make sure to get there early enough to have your seat and be munching on some falafel while you take in the styles and atmosphere that makes Tabbuli Grill the hottest place to be on a Thursday.